Hi, I need to some help with learning to put face in the water. I have just started swim lessons and still can't put my face under the water. All the rest of them can do it. What help can you give me? Learning how to put your face in the water can sometimes be a scary thing when learning how to swim. The best thing to do, if it is something that you find a challenge, is to approach it in stages. We are human beings and we cannot breathe in water (obviously!) therefore the natural response of your body when learning to submerge, is to raise your heart rate, increase levels of anxiety and generally say 'no, don't do this'..! First stage is to get used to your mouth and face getting wet. In water of about chest or shoulder depth, feet on the floor and hold the poolside if you want, place your chin on the water and blow bubbles. Sounds like a kids thing to do, but believe me, if you can do it then the next stages will be easier. Next stage is to submerge your whole face and it is best to do this with goggles on. Get yourself a pair of comfortable fitting swim goggles and repeat the above exercise but submerge slightly further. Go as far as you feel comfortable until you can fully submerge your face and remain relaxed. Wearing goggles allows you to keep your eyes open so that you can literally see what you are doing. Putting your face in the water with your eyes closed only makes it harder for your natural instincts to cope with. Once you get used to submerging this way, whilst standing on the pool floor or holding the pool side, then you can start to work it into your swimming, but only when you are ready. You are obviously determined to conquer this, or you wouldn't have contacted me in the first place! Patience and perseverance and do not worry what the others in your swimming lessons can do. It is all about you and you will learn at your own pace. I would love to know how to open my eyes in the water. Just 7 days now that I started to learn swimming. I have managed to learn how to submerge and breathe out in the water and stay afloat. My problem is I just cannot keep my eyes open inside the water at any cost which is preventing me from going to the next level. This problem is easily solved with the use of swim goggles. 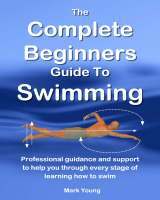 Assuming that wearing swim goggles during your swimming lessons is allowed then you will find opening your eyes in the water very easy. I recommend the use of goggles to all of my pupils because it makes the whole experience of learning to swim easier and quicker. The best place to buy goggles is at your local swimming pool that is if they sell them. That way you will be able to try them on and easily change them if necessary. The two most common designs of swim goggles are two eyes pieces joined by a nose piece, and the all in one style which incorporates both eyes and the nose. The type and style of goggles you chose is entirely your own taste. To fit the goggles to your face, you must place them onto your eyes and then pull the strap over your head. This reduces the risk of injury to your eyes. They must be a comfortable fit around the outside of your eyes and you must ensure there is no hair caught in them as this will let water leak in. When you have used your goggles for some time and got used to them, you will find your confidence in the water will begin to grow very fast. You will be able to swim with a greater sense of where you are and what you are doing. They will quite simply open up a whole new world for you.